I am just going to take this time to blab on a little on our Anxiety issues. Yes, both Tofino and I suffer from it unfortunately. This week, Tofino and I had a really bad show. The worst so far. Normally we have an okayish round then come back strong in the second round. This time however, both rounds were horrible! Included refusals, crashes and elimination. I myself have been diagnosed with having an anxiety disorder and do get treated for it. So come show day, I always make sure I am up to date with my medication and feeling calm. SoZen is a calming supplement that is useful for horses that are constantly battling tension and nervousness in their daily lives. Cavalor SoZen that works to control cortisol levels in horses. When horses are constantly stressed the body creates an abundance of adrenaline and typically not enough cortisol to balance out the hormone levels in the horse. SoZen is very useful for competition horses that have a hard time focusing on their work. We do really well at home, from jumping, to flatwork, to hacking with not many issues to be honest. Come show day, he knows, he feels it, and sometimes even backs away from the trailer. Many people along the way said it is because of me, because I am nervous, I am scared, I transfer it to him, but I promise you my medication works miracles on myself. That being said, I never take it at home when we are jumping and we do just fine. He does have vision issues, finding it harder to jump in flood lights but that hasn’t held us back drastically. This type of anxiety that he has is definitely related to shows as he always holds himself back once reaching the show gate. 1. Objects. The objects that horses most commonly find terrifying include: rocks, farm equipment, cars, buildings, jumps, garbage cans and pretty much anything they consider out of the ordinary. 2. Situations. Many horses are uncertain about dark or enclosed places (like an indoor arena), and even more are genuinely scared of being alone (they are herd animals). Often this fear will be expressed by being buddy-sour or barn-sour, and sometimes they don’t want to go in a ring, either at home or in a competition. 3. Sounds. Highly strung horses are easily unglued by loud, unexpected noises (a car back-firing, a garbage can falling over). Others can’t stand hissing noises (like from a leaky hose coupling), and others don’t like rustling noises (in leaves or under something). Both probably sound like a snake. 4. Clipping or other grooming/handling. Some horses are genuinely afraid of clippers, either the sound or the sensation. Some don’t like to receive shots, and others are anxious about being shod. 5. New places. This can be as obvious as moving to a new home or going to a competition. Or it could just be moving to a new stall or riding in a new trailer. Anxiety could even be caused by more subtle changes around the barn (the jumps were moved in the ring, for instance). 6. Type of work/type of rider. Horses often prefer a certain type of rider. And often horses with a strong desire to please become anxious because they don’t understand what’s being asked of them, either because the exercise isn’t clear to them or the rider’s aids are confusing. 7. Other animals. Horses are often afraid of birds, cows, goats, sheep, donkeys, deer or other wildlife. And some are afraid of other horses. 1. Separation anxiety: Separation anxiety is caused by moving a horse away from herd mates. Horses who are turned out together may dislike being moved from the pasture into the stable for grooming and saddling. They may try to bolt or return to the horse. Conversely, a horse ridden alone in the riding arena may attempt to bolt and return to the relative safety of the barn, where he knows there are other horses. 2. Performance anxiety: Horses, like people, can become anxious before events. Sometimes, they simply pick up on our nonverbal anxiety cues, like feeling their riders tense or hang onto the reins a little tootightly. Other horses learn to associate the sights, smells and sounds of a competition with anxiety.Thoroughbreds that are used to giving their all at the racetrack may transfer this performance anxiety to their new lives, even though the stakes are much lower. They are unable to distinguish between the noises of the track and the noise of the country fair, where their new owners take them to an unrated show. To them, it is still time to perform, and they tense up in anticipation of the event. 3. Situational anxiety: Situational anxiety occurs when horses associate a particular situation with something bad happening. A horse that may have been in a trailer accident as a youngster may associate stepping into the trailer with the pain and fear of the accident, even though years have passed between now and the time of the accident. Such anxiety can be difficult to diagnose if you have a new horse or don’t know your horse’s history. You may know when he gets anxious, but aren’t sure why. 4. Boredom: Although you may not think that boredom and anxiety are synonymous, horses who are bored may also be anxious. These are generally the stall walkers and weavers. They don’t have enough to do, and this makes them anxious. 5. Change anxiety: Lastly, change anxiety occurs when a horse’s living conditions are abruptly changed. Moving a horse from a big, open pasture into a confined stable and a heavy training schedule without any transition can be stressful for him. Some horses dislike having different riders each day and aren’t well-suited to being lesson or rented-trail horses. These horses react poorly to change and exhibit the telltale signs of anxiety, such as eye-rolling, avoidance and backing, spooking and bolting. 1. Don’t look at the object or area of fear. Focus your eyes on a spot in the distance and ride to it. This prevents you from acknowledging the object as something fearful and keeps your eyes, head and balance up and forward. 2. If you have a horse who’s perpetually spooky, try riding with a breastplate, racing yolk or grab strap. This will give you something to grab if he wheels or bolts, other than his mouth. Catching nervous horses in the mouth can often send them over the edge. 3. If the horse is contorting its body to look at an object in or near your ring every time you go past it, and thus disrupting your work, instead of fighting to force him not to look at it, force him to look-but keep working. Ride a leg-yield or half-pass (or even a simple outside bend) that puts the horse’s eye on the object, but follow it up with strong leg aids that force him to continue stepping forward and working. 4. If your horse is walking like a tense ball about to explode, pick up the trot and start riding figures like serpentines or figure-eights. Concentrate on the geometry of the figures and the rhythm of the trot. Ignore everything else. Some top riders sing while they’re doing this to force themselves to breathe consistently and release tension, and the rhythm of the song helps them create a consistent rhythm in the trot. 5. Remember, the hardest thing for some horses to do is walk on a loose rein. The loss of contact with the rider can feel like abandonment, and they’re more likely to become anxious or startled. Although being able to walk on a loose rein is a must, be patient with horses and riders who struggle with this concept. Begin by trying brief periods of loose rein between two letters of a standard dressage court, increasing the amount of walk over time. I did try my friends one for about a month before deciding to purchase one of my own as I was not sure if the price ($200) was worth the product. Ogilvy pads come in different sizes, colours, shapes, and thickness. I personally got mine in the Jumper style, Regular, and 1″ thick. Deciding the colour was hard in itself as the options are absolutely stunning! I tend to go for neutral colours in order to match and our main two are always navy and grey. This also matches our DLC bonnet . The reason I went with the 1″ thickness is due to the fact that my saddle is custom made to fit Tofino, so I just wanted a shock absorbent rather than a saddle fix. I was nervous that it might be too thick for him as I am used to the very slim Thinline which I had been using for years! 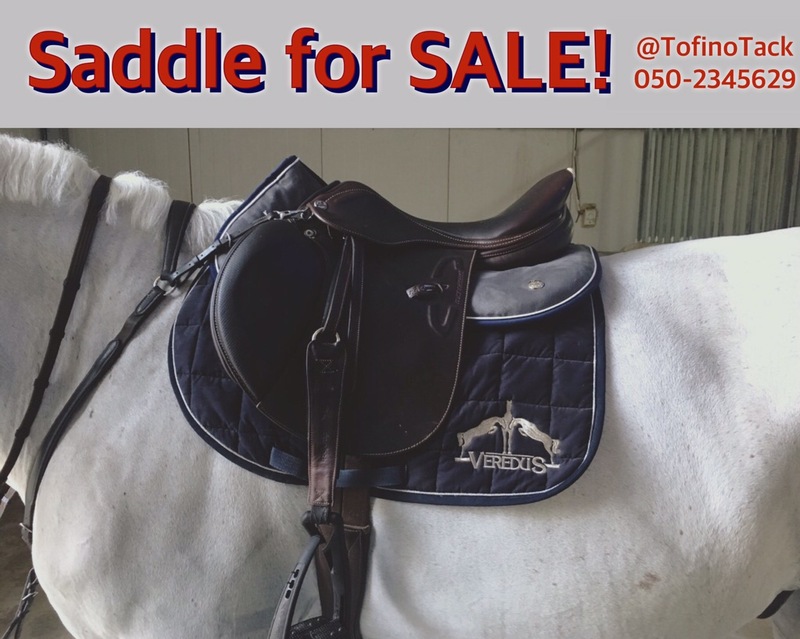 The 1″ seems to fit Tofino really nicely without altering saddle fit. The material is so soft and velvety I am in love!! The top-line of the pad has free space for the spine, and velcro closures to put additional shims if needed, or remove the cover for washing or changing to a different cover colour. As for the underside, so far, it only comes in black but is super fluffy. I have been using it for two months straight, and there is no sign of wear and tear. My friend has had hers for a year and still looks as new as mine, thus making the quality is impeccable. Ogilvy’s are VERY customizable. The grey colour I chose does not show dust which is a great bonus. You get to choose whether you want a single piping with the price or pay for an additional piping. I chose to stick to the traditional white one that already comes in the price and the navy binding. I did get mine embroidered with my initials so as to not confuse it with other ogilvy owners. I chose to do it the same colour as the pad so it turns out subtle and barely visible. Now down to the more troubling parts. 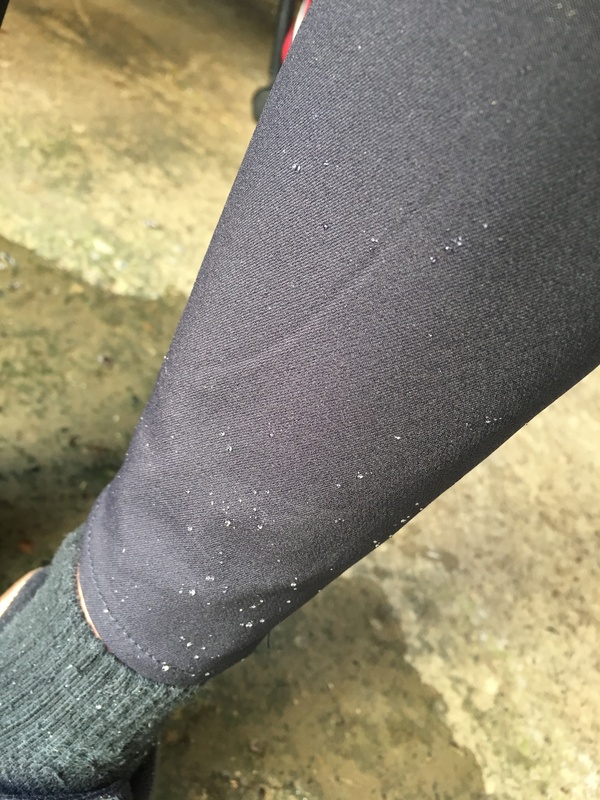 I do find that Tofino’s back does get sweaty after a ride while having the ogilvy on, so I am not sure how the breathability aspect falls into place. It never used to sweat much with my Thinline, however it does so with the ogilvy. I am guessing this is due to the memory foam taking form on the horses back? Not sure,… That being said, he does not have a sore back or sore spots, just sweats. This makes my numnah slip a little. Although the pad is said to be non slippery, which I do agree on, as it stays in the same position you place it on your numnah, however, the numnah tends to slip due to the sweat on the horses back, which I never experienced before using the Thinline. So now, I close my girth in a certain way where one strap is outside of the billet straps on the numnah, and one strap is inside. This tends to secure the saddle pad more. 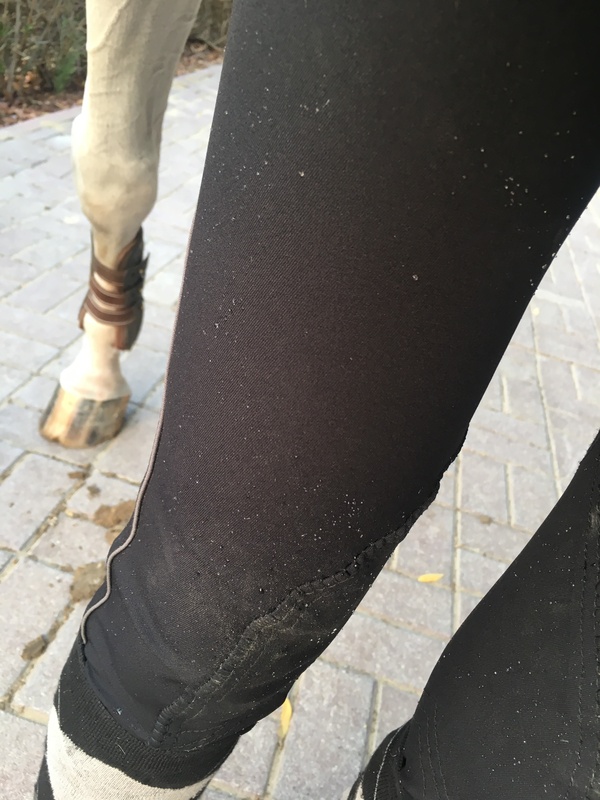 Verdict: I would definitely recommend the Ogilvy Jump MemoryFoam HalfPad anytime! I can’t believe it has taken me this long to even try it. I love that it is not only fully customizable, but also actually really works for both rider and horse.